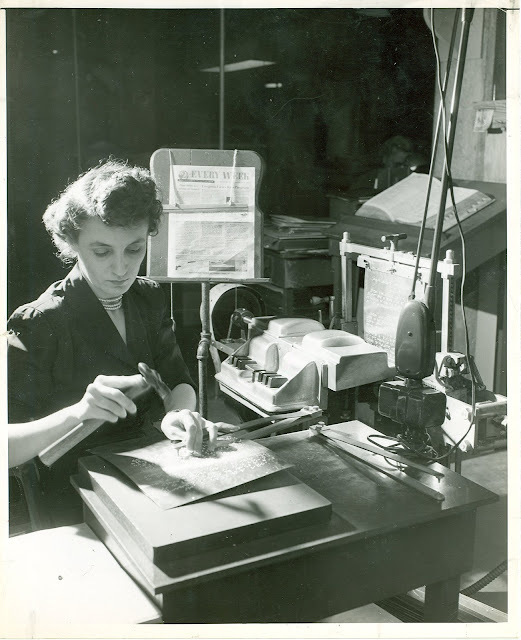 When Frank Hall, Superintendent of the Illinois School for the Blind, invented his braille stereotype machine in 1893—don’t worry, we'll feature it one of these days—he made it possible overnight to quickly and cheaply manufacture braille embossing plates. Put a plate in an adapted platen style printing press and you can make as many copies of a page of braille as you want. Braille production sky-rocketed and the price of braille books dropped dramatically. But if you made a mistake while typing the plate on the stereotyper, fixing it involved a humble pair of correcting tongs. Our object this week is an early pair of tongs used at APH to repair our embossing plates. This was a specialty tool that would have been made locally or in the APH machine shop. By striking the tongs briskly with a hammer, the technician could erase an incorrect dot by flattening it, repair a damaged dot, or insert a missing one. Although embossing plates are infrequently used at APH today—most of our braille is embossed on a digital press driven by a computer—some special projects are prepared with embossing plates and the old tongs are still occasionally used.